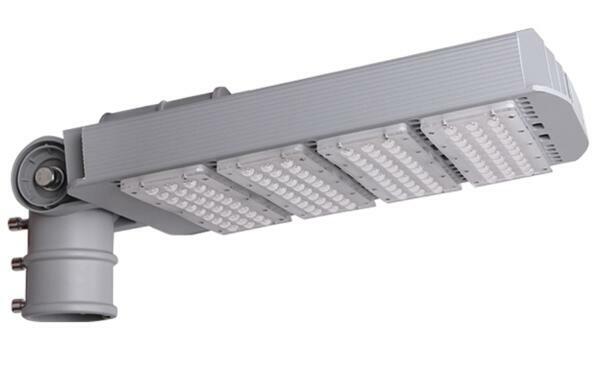 Our 30W-300W adjustable outdoor led street lights all adopt Bridgelux, Cree, Philips LED chip. And the lumen efficiency of led can be 100-125Lm/W. Also we have passed CE,ROHS, ISO9001,CQC certificated with 3-5 years warranty. Our emitting colors include warm white, pure white, cool white. 30w to 300w adjustable LED outdoor lighting fixtures apply to roadway, urban street, residential lighting, highway, garden, park, square etc. Outdoor LED street light fixtures Input voltage AC85V-265V/50Hz Power 90W,120W,150W Luminous efficiency 110LM/W LED chip Bridgelux/Philips3030 Color Temp. 2700-6500k IP rating IP65 Housing material Die-casting Aluminium Lifetime 50000Hours LED Driver Meanwell or Zhihe Warranty 3-5 years Arm angle is adjustable to 180° Save electricity bill. Save 50%-75% electricity cost comparing with sodium street lightsMaintenance-free. Extremely long life reduces re-lamp frequency. Save labor cost to replace lamps with short lifespan. Excellent lens design. Advanced and professional light distribution for street lighting. Great uniformity. High efficiency. Efficiency is up to 100lm/w Enhanced safety. With a superior optical control, LED road lighting fixtures efficiently generates uniform white light, and will enhanced the safety of street. Durable housing. Rugged die-cast aluminum, scratch and fade resistant. Excellent appearance. Tempered Glass. Safe and extremely high light transmittance. Waterproof. IP65. Eco-Friendly. No lead or mercury.No Hazardous Emissions. No UV or IR Radiation. Solid State. Shockproof and vibration proof.